I'm curious what the optic systems the soldiers are getting with the Ratnik setup. I know there were various ones tested but I am not sure which one will be standard. On top of that, if they are going to go the route of having helmet mounted or some sort of google glass like system but with IR/night vision. I seem to remember that the standard night vision optic for the Ratnik 1 kit was a II or III gen Image intensification monocular that could be mounted on the helmet (two would make binoculars) or hand held as a monocular, or fitted on the top rail of the new rifle in front of the iron sights or existing rifle scope to add night vision to the rifle. Can't remember the designation of the sight but look on old ratnik pages on this sight I remember one of them mentioning the ratnik kit including the name of the night vision goggle. MOSCOW, October 10. /TASS/. 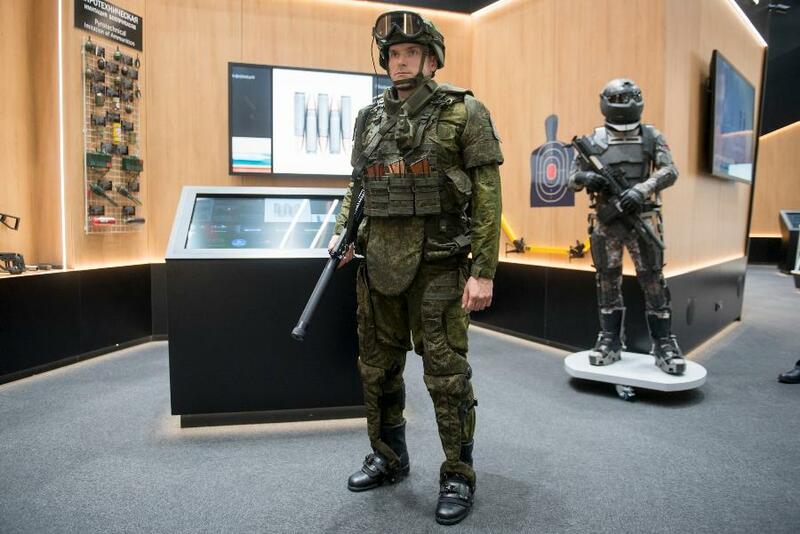 Russia’s Ratnik "soldier of the future" combat gear has got a shockproof watch, which is resistant to electromagnetic impacts and capable of working even after a nuclear blast, Rostec’s press office reported on Tuesday. "The watch, which we have included in the Ratnik outfit, retains its properties upon the impact of radiation and electromagnetic impulses, for example, upon a nuclear blast," Chief Designer for the Life Support System of the Soldier Combat Outfit at the Central Scientific Research Institute for Precision Machine Engineering (TsNIITochMash, part of Rostec) Oleg Faustov was quoted by the press office as saying. The watch is equipped with a self-winding mechanism and continues working accurately in adverse climatic and operational conditions, and also in daily routines and during combat operations. Besides, the watch can even be used when swimming under water. 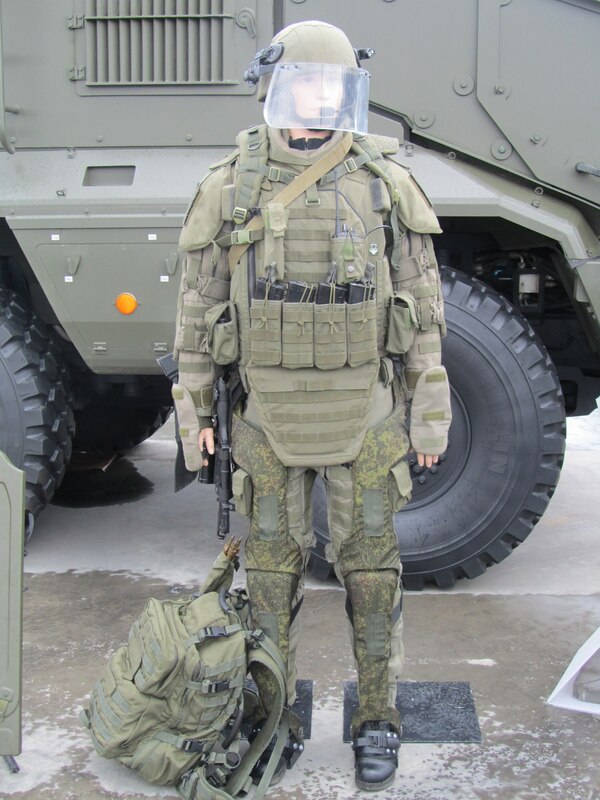 Industrial Director for Rostec’s Armament Cluster Sergey Abramov said that the Ratnik combat gear was continuously upgraded and a modern soldier’s outfit was becoming ever more perfected. "The level of technology and the reliability of the elements of servicemen’s outfit is growing. Correspondingly, the level of a soldier’s capabilities on the battlefield is increasing. This new development by Central Scientific Research Institute for Precision Machine Engineering is another step in this direction," he said. MOSCOW, December 22. /TASS/. Reconnaissance squads of a combined-arms army stationed in the Amur, Jewish Autonomous and Khabarovsk Regions in the Russian Far East have tested the Ratnik combat gear in winter conditions during a two-day reconnaissance raid, the Eastern Military District reported on Friday. "The servicemen wearing the winter version of the Ratnik combat outfit acted autonomously for about 40 hours at one of the district’s training ranges, accomplishing the tasks of carrying out surveillance and gathering data on a notional enemy, and also setting ambushes," the Eastern Military District’s press office reported. "While practicing combat training missions, the servicemen acted on the predominantly mountainous-woody and steppe terrain with air temperatures ranging from minus 23 degrees Celsius in the daytime to minus 35 degrees Celsius at night," the press office said. The servicemen gave high marks to the combat gear in winter conditions, praising its functional camouflage abilities, the warming element, the heat-insulating mat and the footwear. Following the tests, recommendations were worked out for using the combat gear in the conditions of the Far Eastern winter. Over 1,000 Ratnik outfits arrived for military units and formations of the Eastern Military District in May. The Ratnik is a system of advanced protective and communication equipment, weapons and ammunition. It comprises around 40 protective and life support elements and allows a soldier to get continuously updated information about the situation in the combat area. In addition, the Ratnik includes a self-contained heater, a backpack, an individual water filter, a gas mask and a medical kit. The second-generation Ratnik combat gear has been arriving for Russia’s ground forces, the Airborne Force and marines since 2016. MOSCOW, August 27. / TASS /. The active exoskeleton will increase several parameters of the combat effectiveness of the soldier: mobility, including in conditions of the Far North, awareness on the battlefield due to a multitude of sensors, accuracy of the use of weapons, will increase security in several times. This was told TASS by the editor-in-chief of the magazine "Arsenal of the Fatherland" Victor Murakhovsky. As previously reported in TSNIItomash, in Russia, a prototype of an active exoskeleton with installed electric motors and a battery was tested: the tester was able to accurately hit the targets while holding the machine gun with one hand. It is planned that by 2025 such a modified exoskeleton will be included in the equipment of the third generation "Ratnik-3". According to the expert, first of all an active exoskeleton will increase the effectiveness of soldiers in the performance of marches and tactical maneuvers on the battlefield on foot. "Especially when acting in the forest, in the mountains, in the Far North, in urban conditions, that is, where large energy costs are required, just to go to the designated area, make a maneuver to circumvent, cover the enemy," Murakhovsky explained. He added that today the scope of movement during marches is limited not by the capabilities of technology, but by the physical capabilities of the fighters. "We can say with confidence: when applying the exoskeleton, the existing standards of movement will be increased two to three times," the expert added. In addition, the expert noted, a soldier in an exoskeleton with electric motors can take with him an increased ammunition, more water and food. "We know from the experience of the military operations of our troops in Afghanistan that the fighters in the mountains had to carry an increased ammunition due to the reduction of the wearable food stock.It was quite an exhausting exercise.If such an exoskeleton existed, these questions would be lifted," says Glavred of Arsenal Fatherland, . According to Murakhovsky, the exoskeleton will significantly increase the combat capabilities of soldiers in terms of weapons. "The high stability of the shooting, the more stable positions for the destruction of targets both from individual weapons, and from collective samples, such as machine guns," he noted. In addition, the capabilities of an exoskeleton to lift weights and its source of energy "will enable the military to equip a large set of sighting systems," Murakhovsky notes. "These complexes are also very energy-consuming, I mean thermal imagers, laser sights and range finders, opticolocation complexes, target designators, all of which can be built into the kit of each fighter's equipment," the expert said. "Plus we will not forget that modern devices for integration into the command and control system - the same complex" Sagittarius "- also" eat "electricity is not small," he added. At the same time, Murakhovsky believes that, despite its power capabilities, it is unlikely that exoskeletons will be used in hand-to-hand combat. "In modern war, given its most powerful means of destruction, hand-to-hand combat can only take place as an exception," the expert explained. Speaking about the individual defense of the soldier in the exoskeleton, he noted that today for one serviceman the maximum of the cargo carried without special loss of combat capability is 28-30 kilograms, including the means of protection. "The exoskeleton will raise this limit to 70-80 kilograms, and this will allow several times to increase security through the use of more developed and heavier means of protection," Glavred noted. The expert noted that now the main problem in Russia and in other countries developing exoskeletons is the creation of small and capacious batteries. "When talking about two or three hours of action on existing sources - it's about nothing." At least a day the battery should work with the full functionality of the exoskeleton, "Murakhovsky said. The expert specified that, given the problematic nature of replacing such power sources in the field, it would be good to have a battery life guarantee for two days. It is also necessary to have field sources of charging batteries or solar cells, but do not require an extra to carry a volumetric generator - this will only expend the energy of the exoskeleton. Commenting on the possibility of charging exoskeletons from combat vehicles, Murakhovsky noted that "the exoskeleton is primarily intended for actions on foot in battle formation in isolation from the motorized forces." "It makes no sense to use an exoskeleton in motorized rifle divisions operating in the area that is available for armored vehicles, where the exoskeleton can be used by support units for faster replacement of parts, units, assemblies, and field repairs," the expert said. MOSCOW, February 26. / TASS /. Rostec develops the fourth and subsequent generations combat equipment of the “Warrior”, in which active exoskeletons, micro aerial pilots, systems with artificial intelligence will be used. About this TASS reported the industrial director of a cluster of conventional weapons, ammunition and special chemistry of the state corporation Sergey Abramov. "Work on future generations of equipment is underway, we have enough scientific and technical groundwork for this ... There will probably be some kind of robotic complexes, not only with the integration of artificial intelligence, but still with human participation. The possibility of using active exoskeletons is being studied , micro ammunition systems, new weapons, "said Abramov. He noted that very often science fiction writers anticipate technological development. According to the industrial director of the cluster, a conceptual view of the “Warrior-4” can be obtained from their works. To date, TsNIITOCHMASH (part of Rostec) has completed research work on Ratnik-3 and forwarded its results to the Ministry of Defense in order to receive recommendations and an order to conduct development work. "Warrior-3" is the equipment of a fundamentally new level for all component systems - protection, destruction, life support, control and energy supply. Earlier it was reported that the option of equipment will be the same for the Airborne and Land Forces of Russia. Electronic "visor" "Warrior-3" will direct personal weapons at the target on the laser beam. Equipment can get into its composition an active exoskeleton, which increases the capabilities of the fighter's musculoskeletal system. Is the 2nd generation Ratnik equipment already supplied in large numbers to the Russian army? I mean they can talk about 4th, 5th, etc Generation of Ratnik equipment but if its not in use in meaningful numbers in the Russian armed forces then its not really that helpful. Electronic "visor" "Warrior-3" will direct personal weapons at the target on the laser beam. These quotes suggest the personal weapon is 'directed' by the ratnik system... or perhaps do they mean a floating crosshair cursor visible in the visor so the soldier knows when they fire their weapon where their rounds will hit... like in Half Life or other computer game? Note I have a Russian laser with two lasers with a clamp mount you can attach to a rifle and it has a push button to activate it and a switch to change between the lasers... one is visible red and the other is infra red and can only be seen in digital video googles or night vision equipment. MOSCOW, March 11. /TASS/. Russia’s Ground Forces and the Navy’s coastal brigades are practically fully equipped with the Ratnik combat gear, Russian Defense Minister Sergei Shoigu said at a meeting of the State Duma (the lower house of parliament) Defense Committee on Monday. "Almost all Ground Forces units, as well as the Navy’s motorized rifle brigades and marine brigades - 35 units in total - have been provided with the Ratnik-2 modern combat gear," Shoigu said. The serial deliveries of the second generation "soldier of the future" Ratnik gear to the Russian Armed Forces began in 2017. It includes modern small arms, efficient protection package, reconnaissance and communication means, and is designed to operate in various weather conditions on a 24-hour basis. 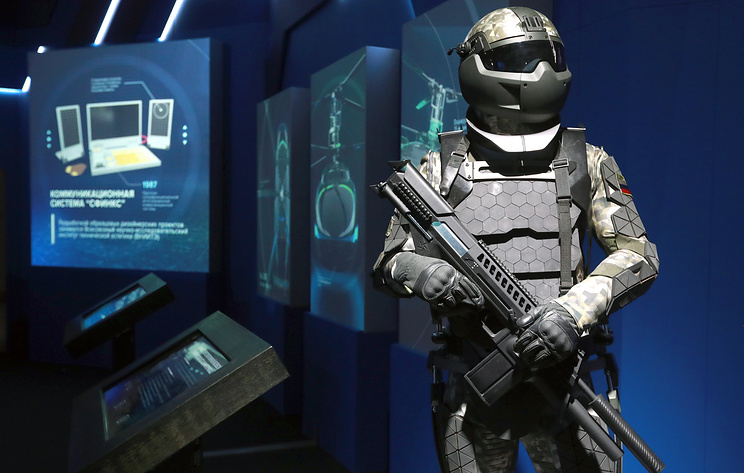 Research is currently underway to create the third generation (Ratnik-3) combat gear, which will include a helmet with an integrated control system, a combat exoskeleton, anti-mine shoes and some other elements.